The Herald Sun had an interesting article describing the trip home from the football on Friday night, and the delays suffered by those in the crowd. Apart from the football at the MCG, there was also a concert in the tennis centre, and soccer at Etihad Stadium. Edit: plus rugby at AAMI stadium. In fact an earlier Age story had explicitly warned that the city would be busy. The Herald Sun article notes a variety of issues: delays at the Richmond station gates, crowded platforms (and queues on the ramps), screens with wrong information, and trains too full to board. Here’s the annoying thing: getting a hundred thousand people home should be easily handled by the public transport network, the trains in particular, if it’s planned right. The system deals with over double that every evening peak hour, and also on New Year’s Eve (though fare collection is waived then). Richmond station doesn’t handle crowds well. The current station is 55 years old; in 1960 it replaced a smaller station built in 1885. Although the subway (at the MCG end) connecting the platforms is pretty wide, the ramps and platforms aren’t, and crowding tends to occur at the western end (particularly on platforms 9+10) when large numbers of people arrive at once. This is difficult to solve without expensive upgrades, which are needed, but probably aren’t going to happen any time soon. Encouraging people to move along to the far end of the platform will obviously help. Yes, the gates slow people down, but this is probably not a bad thing if there’s crowding inside the station anyway — regulating the flow of people (and stopping them if necessary — a scenario common in places like London) helps stop it getting worse. So I suspect the populist calls to “throw open the gates” are a little simplistic. Revenue collection is important — and large numbers of people using the service helps pull in the kinds of Real Money needed to keep it running and to upgrade it. On weekends in particular, just leaving the gates open would lead to a large amount of fare revenue lost. 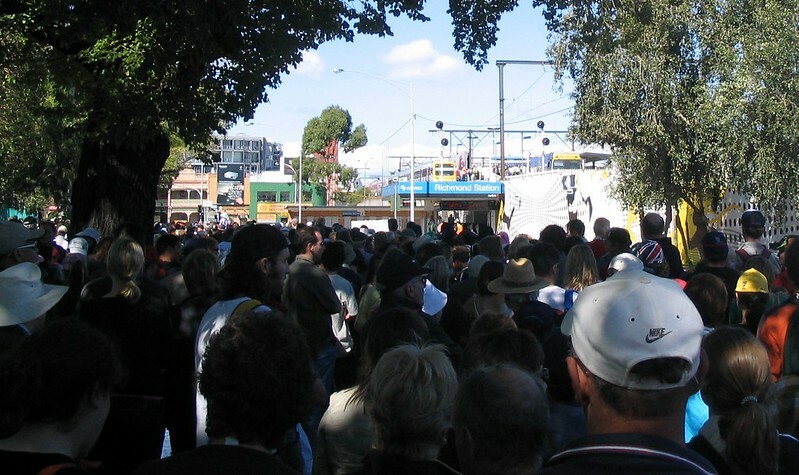 One solution would be to include fares in the costs of event tickets — this is common in other cities around Australia, and might also make it possible to permanently close Yarra Park to car parking. Obviously this would mean even more provision being made for crowds using PT — and it probably needs to be shown first that this is a viable option. It’s worth noting that free public transport (and a venue parking ban) was included with Commonwealth Games tickets in 2006. This didn’t prevent long queues getting back into the station after big events, as shown below. For the Commonwealth Games, they had someone with a PA making frequent announcements, making sure the crowd was kept informed. If they’re not doing that now, it would also help. I’m told there’s also signage around the MCG entrance pointing “parents with children” to the wide gates. What they really mean is “prams and wheelchairs”. The current wording creates unnecessary cross-flows, and should be re-written or removed. PTV/Metro are encouraging people to go the long way around to the Swan Street entrance, and this is a good thing — though maybe they need to try harder, and remind people that apart from it only being an extra 2 minutes’ walk, it’s also likely to be quicker overall, as there is less queuing. But the real problem here is the lack of extra trains. 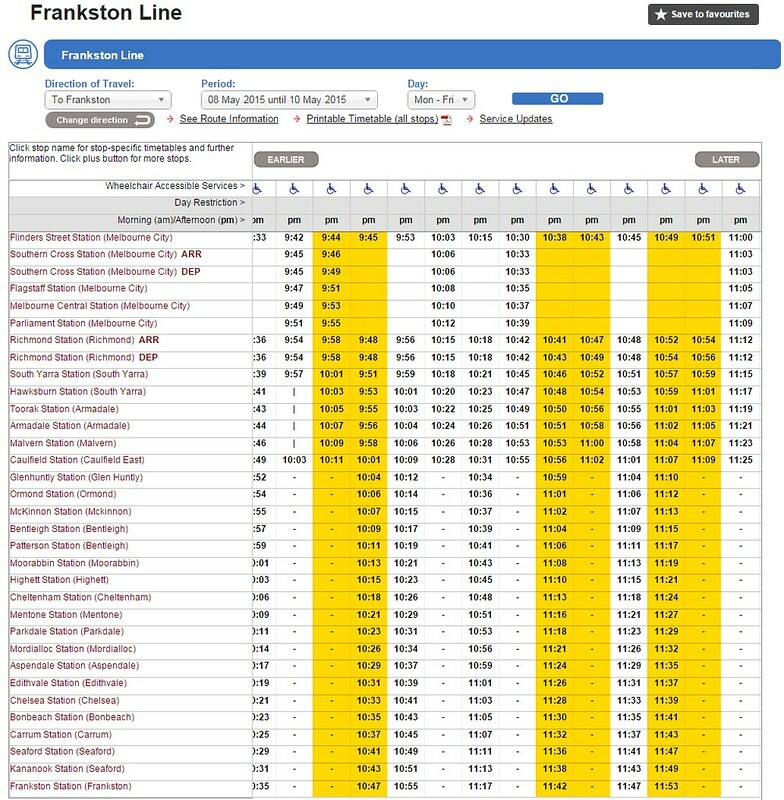 Here’s how the timetable looked on Friday night: this is the Frankston line timetable being shown, but it also shows Dandenong line trains as far as Caulfield. The yellow shows the extra services. 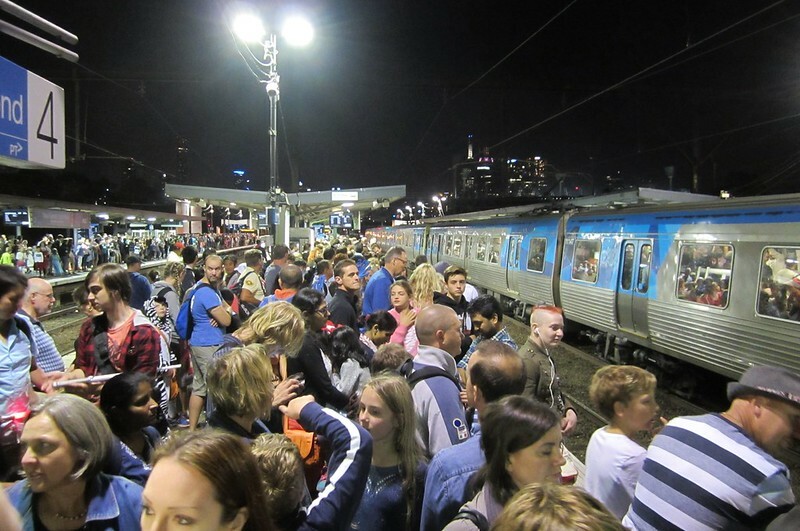 On Friday night, PTV and Metro put on just a single extra train on the SE/E/NE lines after the Etihad soccer (crowd: 50,871), and another 1-2 extras on each of the SE/E/NE and Sunbury lines after the MCG AFL game (crowd: 52,152). But the Herald Sun cited soccer crowds still heading home when the AFL finished almost an hour later, so it’s self-evident that it wasn’t sufficient. And this specific AFL game was a big win for Geelong — how many Collingwood fans left early, reducing the crowd size after the game? I don’t get to the football a lot, but I’ve been to other big events which should be served well by public transport, and it’s often disappointing how long the crowd waits on the platform for a train home. I know a bunch of planning goes into big events, but it’s hard not to draw the conclusion that more trains are needed, and they may need a few trains (and drivers) on standby to run if crowds are larger than expected, or the event finishes early or late. This in turn requires the operational flexibility to deploy resources independent of a set-in-stone timetable. If they were really smart, just after the events start, they could crunch the Myki system data and work out how many people had arrived, and where they were likely to be travelling home to afterwards (their originating station that day), and check that against the services running on each line. At the very least, they should be analysing it for following weeks (though obviously it varies according to who is playing). Clearly if the PT system is to maintain and grow its market share to big events, it’s going to have to provide a better service, or people will start to switch back to their cars. A single train can move 1000+ people, and each track can run a train every 3 minutes or so. There’s no better way of moving tens of thousands of people out of the sporting/events precinct — if the system is planned and operated well. Related: The Urbanist: Does anyone really need to drive to the footy? thanks for a good summary as usual. Your comment that many sport tickets “include fares in the costs of event tickets” sounds OK, except that a footy ticket costs $25, whereas a myki costs $7.52. That’s 30% of the cost of the ticket. I can’t see the AFL agreeing to leave ticket price at $25 and then pay $7 odd to myki out of this. The AFL would bump up the ticket price by 30%. I was at the Pies v Cats game at the MCG that Friday night, and using the MCG-end entry to access platforms 9 & 10. I left with the crowd at the end of the match, and found the journey through the barriers pretty easy. This may have had something to do with a Belgrave/Lilydale train having recently departed and a Glen Waverley line already sitting on platform 9. But the crowd grew quickly on the platform. Yes, people were moving down to the eastern end of the platform, but it swelled to the point where only pushing would allow more people to fit on. Almost 10 minutes passed until a train finally entered the platform. I suspect it’s the full platforms, and not the Myki gates, that are holding up people from entering the station more easily. Back in the 90s footy-special trains were held on the platform, waiting for the footy public to arrive. It’s easy to do with platform 10, which is otherwise only needed in peak-hour. These days, the trains wait somewhere in the loop or near Flinders St. And so when the call goes out that they’re ready to bring the trains into the platform, it’s already too full on the platforms. IMHO it’s also rather dangerous for trains to glide in to such a full platform. Somebody could easily be pushed on to the tracks. And people trying to walk down the platform are walking on the “dangerous” white section on the edge of the platform. I’m surprised to have not heard any reports of people being hit by the driver’s mirrors! The 10-minute weekend day-time frequencies are working well with the large Saturday & Sunday crowds for the platform 9/10 travellers. It’s the night-time and twilight games that continue to struggle with the way things are currently organised. Refering to Roger’s comment, ‘joint ticketing’ as it is called in Perth works extremely well – almost all of the large events we have are covered by a joint ticketing arangement. Concerts at Perth Arena, AFL, Rugby Union, Music Festivals etc etc all have free travel to and from the event, but the cost is cheap. For example a concert ticket in Melbourne might be $99 – the cost of the same concert in Perth is just less than $102, so over all the cost of transport two and from each event is less than $1.50 each way – pretty darn cheap! When it’s compared to the actual cost of travelling even in one direction from Mandurah to Perth (about $9 one way, keeping in mind we don’t have a weekend cap like Melbourne) it’s a darn cheap and good alternative to using the car. Joint ticketing also allows Transperth to put on the extra train services needed to move the large crowds. At the end of the day $1.50 each way on public transport (train, bus and ferry) to an event is pretty darn good. It’s cheaper than driving and parking, and as we have found only increases the ticket price slightly. If Melbourne were to put in a similar joint ticketing arrangement, it would have to be of a similar price to that of Perth to avoid, as Roger said, event patrons abandoning PT and driving instead. Recently I noticed on the new Perth stadium railway station that is being constructed at present. The master plan includes dedicated train services..
* Six-platform Stadium Station for specific destinations for easy transfers. *Nearby stowage for up to 117 railcars to keep a continuous flow of trains following events. *Upgraded East Perth Station to accommodate additional passengers on event days. This is the link if people are interested to read..
“I’m told there’s also signage around the MCG entrance pointing “parents with children” to the wide gates. What they really mean is “prams and wheelchairs”. The current wording creates unnecessary cross-flows, and should be re-written or removed.” Actually, the issue also arises for young walking children who do not have cards of their own (because they are under 5.) They have to go through the gates holding their parent’s hand, so narrow gates are almost impossible (and, for adults or children inexperienced with this maneuver, even the wide gates can be tricky.) Maybe, ‘parents with young children’? In some circumstances, organisers of large events and conferences may arrange public transport ticketing for the event’s participants (participant means an event or conference participant, attendee, spectator, delegate, member, and includes complimentary tickets) through prior arrangement with PTV. A fee of $3.00 per participant, per day for the total number of participants for the total time of the conference or event is charged (including complimentary passes). For example, a 4 day conference with 1,300 participants would pay $15,600 (1,300 x $3 x 4 days) for access to public transport. The fee provides for unlimited travel on bus, train and tram within Zones 1 – 2 on the day/s of the event or conference. So the short answer is that if the AFL chose to arrange joint ticketing, it would increase ticket prices by $3 — $1.50 each way per person, which is in line with the Perth pricing that Joe has cited above. Hopefully the AFL and cricket authorities are aware of this, but the information is so well hidden away, other event organisers may be oblivious to the option. The interesting thing about combined fares is that how many people actually come from outer z1+2 locations to watch the footy and go to other major events? The numbers go into the hundreds if not thousands. It would be very hard to enforce the combined ticketing on V/Line services that run beyond the z2 boundary. That would mean an increase in an AFL ticket of 12%. And seniors card holders would get no PT advantage on the weekend but pay the extra $3. Those PT users with weekly/annual pass will be slugged the $3 and yet have already paid for travel. People like me (myki money PT user earning a good wage) would be the winners. It’s probably not the fairest proposal. I am opposed to loading event ticket prices to include public transport. Why should people who live nearby and walk to the ground, pay extra ? And why should people who already have a periodical ticket which covers travel to that station, pay extra ? I am unconvinced by the assertion that comparing concert prices in Perth and Melbourne proves that the public transport component of the fare is cheap. There are a lot of other differences in costs of staging events in Perth and Melbourne, and in any case the price of the tickets is often influenced by supply and demand, the price level a particular market will bear, and the size of the venue. Some people are prepared to pay “whatever it takes” for rare treats like their favourite rock band. There might never be another opportunity to see them. The footy is not like that, people will be more price sensitive for something they are expecting to go to several times a year. And we will be having a similar event, the following week. That will be another $4,500, am I correct ? What is the name of our event, you want to know ? We just call it “coming to work”. $3 a day ?? Nice if you can get it. @enno, what does prove that “the public transport component of the fare is cheap” is Transperth’s own documentation – which states $2.36 per ticket. Of course what Perth doesn’t have is a weekly/monthly/whatever pass system, or even a financial incentive to use the smartcard system (versus buying a paper ticket) in many cases when multiple people are travelling together. Using platform 10 sounds like a good idea. The demise of the Jolimont Yards has not been good for events crowd dispersal. Most of the lines that go through Richmond easily have the patronage for 20 minute service after 10pm/7pm (weekdays/weekends) and the Sandringham line already has them. The base frequency should increase. I experienced this crowding firsthand this past Friday evening. I could just barely squeeze myself into the 6:50 (approx.) PM train heading to the city at Windsor Station on the Sandringham line and quite a few people were left behind on the platform to wait for the next train which was probably also filled to capacity. I told the other passengers I didn’t even need to hold on to anything as it would be impossible to fall over with people squeezed in like that. At Prahran and South Yarra stations there was just absolutely no more space for anyone else to get on. Of course at Richmond nearly everyone got off leaving the train mostly empty for the short ride to Flinders St. An extra service or two would have made a big difference and since sports events are planned it should be all too easy to plan to run an extra train or two. The demise of sharing the middle tracks between Richmond and Caulfield between the Pakenham Cranbourne and Frankston lines in the evenings and on weekends (which has increased legibility and allowed 10 minute services on weekends, which is very good) has removed the ability to leave trains sitting on platform 6 at Richmond. Run something that a decent percentage of the crowd might stay and watch after. A concert with bands looking for a start comes to mind. Crowds know getting out is a pain, so if you can reduce it to a continuous trickle over an hour or so you’ve done the job. Most MCG match ups have a significant ‘walk up’ component as part of the overall attendance (and plenty of Etihad matches are in the same boat) – meaning a significant percentage of the attendance won’t have pre-purchased their ticket, and therefore won’t have a PT ticket for their inbound journey. If you wanted to move to an integrated ticket approach, you’d need to move away from this model – would prove challenging to the culture of ‘going to the footy’ for plenty of people. @The Unknown, it’s far easier to enforce fares on V/Line trains than any other services, as conductors check tickets on all trains. @Mike, having a band afterwards is the Grand Prix’s strategy, helping to spread travel demand immediately after the race finishes. It was also a tactic during the Commonwealth Games, with promotion of cultural events in the evenings around the inner-city. @Gobillino, good point, though not insurmountable. Perhaps you could arrange to discount the walk-up tickets by $1.50 to compensate – or perhaps still sell tickets at the ground, but not discount them, providing an incentive to pre-book (which helps assist planning). Plenty of those newspaper associated running events include public transport with the event fee. The paper bib serves as the ticket. People seem to be fine with that. These extra services cannot disrupt/delay the normal OPR services and as such can take time to get in position, which I suspect is why there’s such a large gap between the normal and the extra services after games/events. • Secondly, the new Perth stadium is located along the Armadale line, and as fans come from all over Perth, majority would need to interchange at Perth Station/Perth Underground Station for their train lines. This makes it easier as majority of the crowd is going in one direction as opposed to 5-10 different lines as Richmond and Southern Cross have. It does warrant having a frequent service every 1-3 minutes to Perth CBD, whereas there isn’t enough demand to run every line in Melbourne (nor in Perth) every 1-3 minutes after the game/event. • It doesn’t help that you have multiple lines running through the same platform. For example, at Richmond platform 9/10 you have Alamein, Belgrave, Lilydale and Glen Waverley line passengers all waiting for their extra services. This not only compounds the overcrowding further, it slows down boarding these extra services, as you may have a half empty Belgrave train on the platform waiting to fill up, whilst the Lilydale/Glen Waverley passengers overcrowd the platforms, potentially slowing down Belgrave passengers still waiting down the ramp (and overflowing outside the myki gates). The same applies for Southern Cross which is suffers pretty badly due to more sharing of platforms between multiple train lines to each platform. Compare this to platforms with a single train line running through i.e. platform 2 at Richmond for Sandringham line or the new Perth stadium station, you will notice crowd flow is more manageable as you don’t have people unnecessarily waiting on the platform for their line specific train. • Finally, although I haven’t done my research on bus ridership/car travel to the game, going by the information found on the PTA website, more than 50% or about 32,000 will take other forms of transport other than by trains. Whereas, for our games/events train ridership would by higher than 50% to the game. This is based on the limited car parking at both MCG and Etihad stadiums as well limited bus/tram routes around these venues, whilst Perth is predicted to have a high ridership by bus to the stadium. As far as I know, passenger numbers are gathered for every special train after an event, and used as a basis for future planning. Although one can get pretty good at predicting crowds based on who’s playing, there can always be surprises when you get significantly more than you expect. Also, how much should you believe the media? This is an account of one person’s experience on one line. And it’s a second-hand account, not that of the journalist. But even going on what the report claims—the timetable posted shows Frankston trains at 10.43, 10.48, and 10.54. The first two of those trains depart five minutes late each. The fan the journalist talked to got on the second of them (albeit squeezing on). 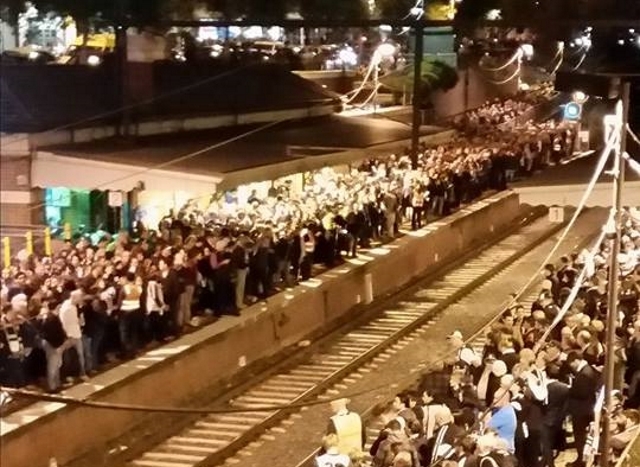 There was still another train to come, which for all we know cleared the remaining crowd—just what is the problem? But even if there had been a problem, would it have been due to a lack of planned services or some problem causing one or more of those services to be cancelled? The media never know the full story. Nobody posting here knows the full story. I’m not suggesting that we can’t form opinions about what should have been done, but we need to be careful to not think we know better than the planners. My point is that, yes, perhaps it would be a good idea to have one or two or whatever trains on standby, at least to cover cancellations (assuming that wasn’t already the case). But to suggest that it wasn’t planned properly just because it (allegedly) didn’t work well on the day might well be misidentifying the problem. Not true. Even when they shared the centre tracks, the normal arrangement was to separate them when there were special events on. What you don’t want is a regular Frankston train on platform 4 and a special for Frankston on platform 6. If you were on one and the next train came on the other, you would not be happy. So on those occasions they would alter the routing to have Frankstons—regulars and specials—on 4 and the Dandenongs on 6. Just as is the case now with the regular timetable. I don’t believe that it has made much difference, at least for Richmond. 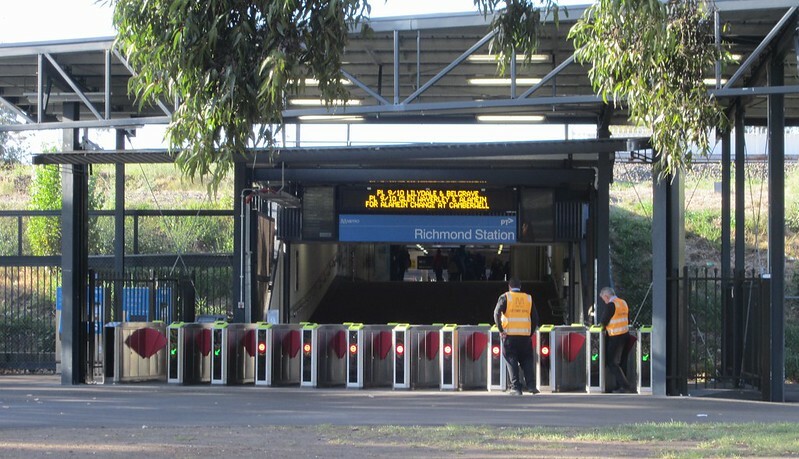 Most of the sidings in the former Jolimont Yards did not have direct access to Richmond, so trains had to be shunted into the platforms then run to Richmond. Now there are the Melbourne Yard and North Melbourne Sidings that are nearly as close, and don’t require the trains to reverse at Flinders Street. Is revenue collection imported on Saturday/Sunday when fares are capped? Most people would have already activated their fare on the way in. I understand this doesn’t take into account Friday nights and mid week. @Chris, that was the case pre-2014 when the weekend cap was $3.50 — about the same or less than the single fare. In January 2014 the weekend cap went up to $6, while the single adult fare is $3.76, so potentially it’s a loss of $2.24. Multiplied by tens of thousands of people, and a couple of dozen games per year, it’s a fair bit of money! Friday nights is an interesting one — for people who have travelled to the game and commenced their trip at or after 6pm, (on any night of the week) they don’t pay another fare to get home anyway, because after 6pm a fare lasts until 3am. The big problem with locations such as Richmond is, you can not park trains ready to take the crowds as soon as the crowds come out. Because you shall be blocking regular services if you do. One solution would be, to add crossovers at each end of the Richmond platforms, and you can have the footy special to Pakenham held on say #6, while you let the regular services to Pakenham continu as normal by crossing over to #5, or even over to #7. Given the low frequency of regular services late at night, you may get away with six of seven trains sitting there waiting. You may also have additional sidings somewhere between Richmond and Flinders Street, not to the full extent of the old Jollimont yards, but three or four of them should help, to hold a second wave of trains to come in once the platforms have been vacated of their trains.